The 20 x 32 foot hoop house installed at UNG is a temporary unheated greenhouse used to cover crops to extend their growing season. University of North Georgia’s (UNG) College of Education unveiled a new greenhouse, known as the Hometown Harvest Hoop House, at the Appalachian Studies Center (ASC) on the Dahlonega Campus on May 10. More than $16,000 in donations and materials were raised by Leadership Lumpkin, a volunteer program facilitated through the Dahlonega-Lumpkin Chamber of Commerce & Visitor Bureau. The 20 x 32 foot structure was donated by Chestatee Chattahoochee RC & D Council, a non-profit that supports conservation and development for healthy communities, ecosystems and enterprises. A hoop house, a temporary unheated greenhouse used to cover crops to extend their growing season, was installed to help combat food insecurity in Lumpkin County. "This effort will support the collaborative work of university students and community members of the local 4H chapter. 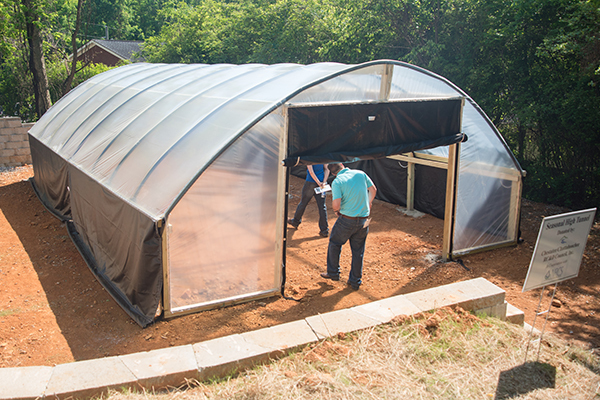 The hoop house will provide food for both the campus and community food pantries while serving as an outdoor learning lab for university students and professors," said Dr. Susan Ayres, dean of the College of Education at UNG. "Our first project in the hoop house will be the construction of salad tables – shallow raised beds on legs that provide easier access for gardeners. They will feature food that children and students will enjoy growing and eating, including herbs for a pizza garden, such as basil, thyme and oregano, said Rosann Kent, director of the ASC. 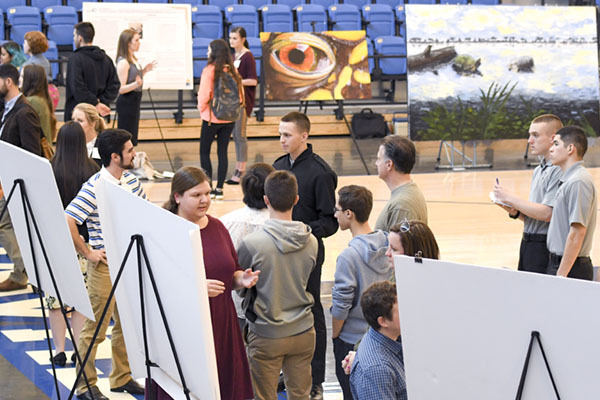 Leadership Lumpkin hosts a leadership class each year made up of area men and women who are tasked with developing a project to help the community. 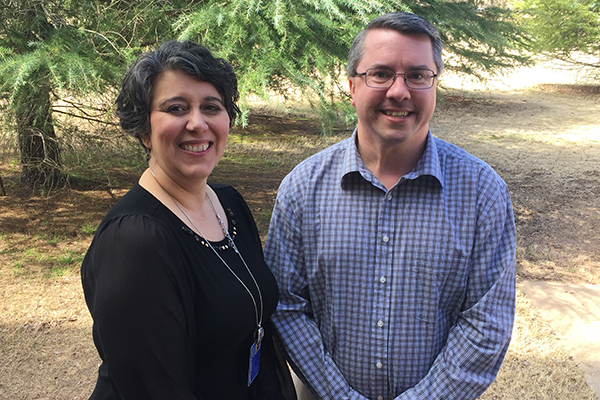 This year’s class include four UNG staff members: Jessica Brown, associate director of recreational sports; Erick Jones, director of the Student Money Management Center; Anna Brown, special events coordinator; and Chris Adams, director of network services. As chair of project team, Brown believes in the sustainability of the hoop house. "Our ultimate goal was to raise $10,000—or more. We did not want to just build the hoop house and say ‘Okay, Rosann, good luck.’ We wanted to provide enough funds for the raised beds, wheelchair accessible salad tables, a retention wall, and the French drains. We wanted to build a hoop house that would be sustainable," Brown said. Although Leadership Lumpkin spearheaded the project with a benefit concert and quilt raffle, other community partners such as the Lumpkin County Extension Service, Georgia Mountain Master Gardeners, and the Community Helping Place are participating as partners in the Hometown Harvest Hoop House. 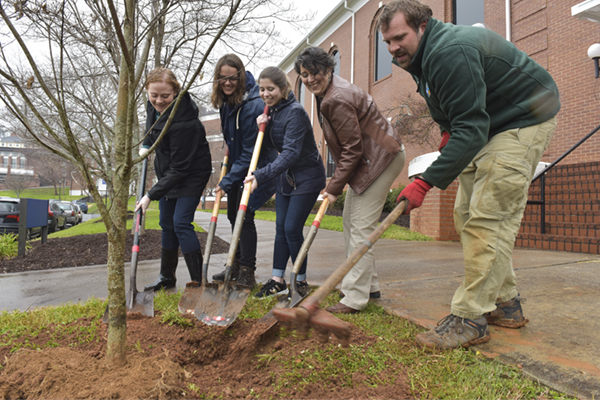 UNG’s Department of Teacher Education, the UNG Department of Biology, the UNG Student Community Garden Club, and ASC will collaborate to provide programs and facilitate this new teaching space. Along with several others in the community, Chesley Davis of the Lumpkin County Extension Service had been concerned about how to address the need for a continuous supply of fresh produce. "There's a huge need for the people in our community to learn to grow their own food, and Lumpkin County has a long tradition of gardening, so it's great that part of the ASC's goal is to pass on local traditions," Davis said.